The October Spotlight at Inter|Sekt shines on Laura with a new far-ranging interview. Jacqueline Moran’s thoughtful article on Laura for The Daily Californian includes this interview. Laura speaks about Author: The JT LeRoy Story with Salon, People, The Hollywood Reporter, Vanity Fair, Page Six, The Creators Project, OUT, Unicorn Booty, the San Francisco Examiner, New York Magazine, and the New York Daily News. And here are Laura and Author‘s director Jeff Feuerzeig speaking with V Magazine, Jezebel, and The Mary Sue. The breakthrough interview Laura gave to The Paris Review. Interview Magazine interview, August 2013: Laura talks about David Milch, Courtney Love, Andy Warhol, and JT LeRoy; with photographs by Steven Klein. Gender fluidity is one of the topics when Laura talks to journalist Nadine O’Regan at the Mindfield Literary Stage in Ireland. Laura tells all to the Spanish fashion magazine ODDA. Laura the indie fashion fighter tells the SF Chronicle, “Fashion makes me accessible” — and here’s how she does it! Lastblog turns to Laura for answers about the creative process, art, fashion, and JT LeRoy. 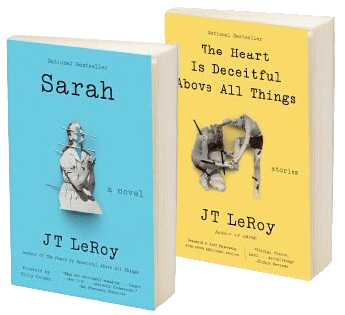 One From The Heart, June 2013: Laura speaks to the San Francisco Bay Guardian about herself, JT, and The Heart Is Deceitful Above All Things. Jowita Bydlowska interviews Laura for Random House’s magazine. Laura returns to her roots for the Brooklyn Book Festival. The San Francisco Chronicle tries to catch up with Laura. RU Sirius at 10zenmonkeys.com speaks with Laura.